This is a sponsored post written by me on behalf of Chamerlain for IZEA. All opinions are 100% mine. I spend a LOT of time in my garage. In fact, after we purchased this house it was one of the first 'rooms' in my house I fixed up because it is so much more than a garage for us. It is a mudroom, and workshop and storage area. Right now my garage is full of projects and I'm not actually parking my car inside. Because it is more of a workshop than a parking spot, I am constantly coming and going out, opening and closing the door to control the temperature, or let light in, or to load and unload my building supplies and thrift store treasures. But that is NO LONGER A PROBLEM! Thanks to Chamberlain, who sent me their new MyQ Garage Smartphone Garage Door Control. Now, anytime I have my cell phone with me, I can open, close and monitor my garage door. No more forgetting if I left it up! No more searching for the remote amongst the stale french fries on the floor of my minivan! The components of the system are really straight forward: A WiFi hub and it’s power cord, and a battery operated door sensor. That is it! No cords to attach to the opener, no long wires from the door.. no secondary wireless hub. 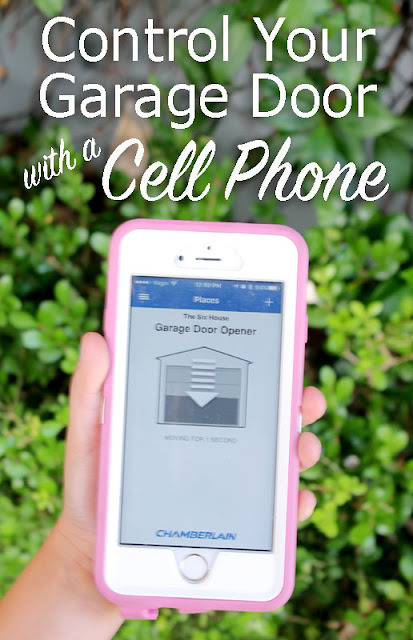 It connects to the garage door opener you already have!! A lot of other wireless systems are an entirely new garage door opener. No thanks! And because the system is so simple, the installation involves screwing in 2-4 screws.. nothing else! A piece of cake! After removing the WiFi hub from the box, I synced it to my phone using a Bluetooth connection. (I have an iPhone 4s but it is also compatible with Android.) Once I have downloaded the app and set up my account it is time to give the WiFi hub a permanent home. The mounting bracket installs with two screws, which are included. I hit a stud so I just needed the two screws. If you are installing your bracket into drywall, they include drywall anchors as well. I installed a mounting bracket a few feet away from my door opener, and close to an outlet. I slide the WiFi hub onto the bracket and ran the cord to the outlet. Because I had synced the hub to my phone previously, the green light immediately went on. Next I installed the garage door sensor onto the top panel of my garage door. I used the mounting strips that were included (since my door is very thin MDF paneling) but if you have a solid wood or steel garage door, they also have mounting screws available. Now I was ready for a test run! The app runs you though the set up with clear instructions and photos. For my opener it only required me to push a button on my door sensor, and to push a button on the back of my door opener. The app had detailed instructions for locating both buttons and for selecting the correct make and model of door opener. I love all the features of this new device. And I made this real time demonstration video to show you a few and to show you how easy it is to operate the app. You can find the MyQ Remote Door controller online or at your local big box hardware stores. Learn More or visit Chamberlain on Facebook and Twitter.